Is there a better alternative to CheckMyMac? Is CheckMyMac really the best app in System category? Will CheckMyMac work good on macOS 10.13.4? 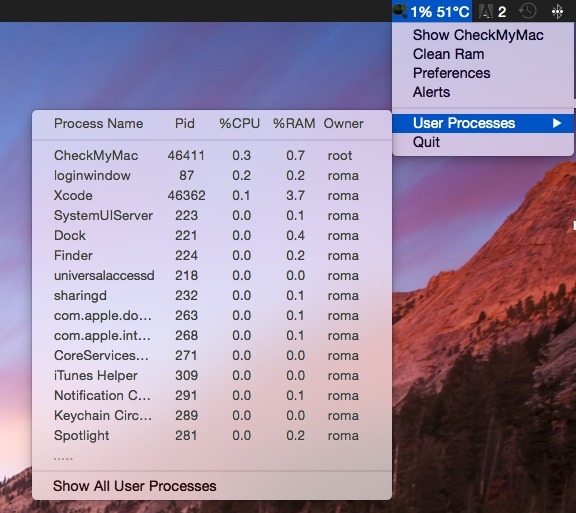 CheckMyMac monitors key components in your system and helps preventing major malfunctions before they happen. Schedule alert notifications based on various temperature sensors in your system. Clean inactive and leaked RAM in your system. Clean dust by blowing the air out of your Mac for limited time. 3 modes -- full view, compact view and status bar. Note: Special offers are available here. Note: A trial version can be found in Related Links. CheckMyMac needs a rating. Be the first to rate this app and get the discussion started! CPU - Average CPU usage and each core usage and its temperature. RAM - Monitors RAM usage. 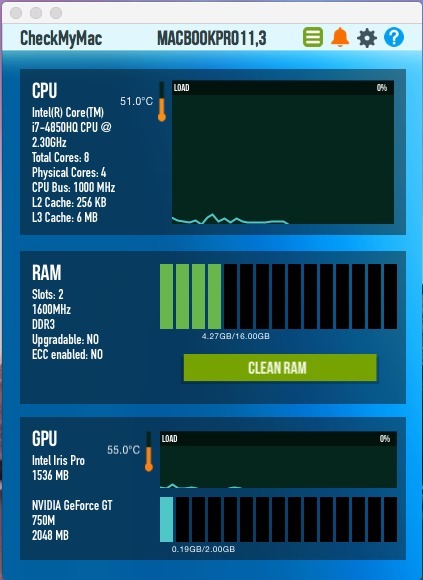 GPU - Monitors dedicated GPU usage and its temperature. VRAM - Monitors VRAM usage. Fans - Monitors fans RPM as well as grants control over the fans' RPM. Temperature sensors - Monitors various temperature sensors.